SGQ last traded C$0.30 on November 24, 1878 closed +10.95% Tuesday on the announcement. November 30 -- This announcement is made by SouthGobi Resources Ltd. (TSX: SGQ, HK: 1878) ("SouthGobi" or the "Company") pursuant to Rule 13.09(2)(a) of the Rules Governing the Listing of Securities (the "Listing Rules") on The Stock Exchange of Hong Kong Limited (the "Exchange") and the Inside Information Provisions (as defined under the Listing Rules) under Part XIVA of the Securities and Futures Ordinance (Chapter 571, Laws of Hong Kong). The Company is pleased to announce that Toronto Stock Exchange ("TSX") has confirmed and announced today it has completed its review of the Company and has determined that the Company meets TSX's continued listing requirements. Pending the issuance of this announcement, trading of the shares of the Company on the Exchange was halted with effect from 9:00 a.m. Hong Kong Time on Monday, November 30, 2015. An application has been made by the Company to the Exchange for the resumption of trading in the shares of the Company with effect from 9:00 a.m. Hong Kong Time on Tuesday, December 1, 2015. December 1 (Proactive Investors) Aspire Mining (ASX:AKM) has received a key railway construction licence in Mongolia, setting up advancement of a critical and ambitious infrastructure plan to support the company's prized Ovoot coal project. The company's rail infrastructure subsidiary, Northern Railways, has received its government construction clearance for the Erdenet to Ovoot railway, a project that spans 547 kilometres and forms part of a national policy aimed at connecting the northern provinces with Russia. At full operation, the project will have capacity to move 30 million tonnes per annum of bulk commodities, agricultural, general and passenger freight including transit freight between Russia and China. Grant of the licence to Aspire follows the signing of a concession agreement with Northern Railways in September and satisfies a precondition for the start of long-term land use negotiations. It also allows for the establishment of a commission comprising Northern Railways, the government and Mongolia's national railway operator to agree on traffic management protocols and the point at which the proposed railway connects to the existing network. In late August, Aspire secured financing from its rail and financial adviser Signum Resources Corporation to carry out the first stage of the feasibility study for the rail project. Signum will provide a US$600,000 loan and invest US$200,000 in Aspire equity as part of the effort. Aspire's new construction licence for the rail project builds on a string of recent milestones, including a Scoping Study what indicated there were no technical obstacles to building a rail connection from Ovoot to the Russian city of Kyzyl. This connection, also known as the Steppe Railway, was projected to require capital costs to construct base infrastructure ranging from US$2 million to US$2.6 million per kilometre. Capital costs for an alignment from Ovoot to Arts Suuri on the Russian border was estimated at US$450 million to US$550 million for the 230-250 kilometre line, while the 300-330 kilometre Arts Suuri-Kyzyl could cost from US$675 million to US$775 million. The rail will not only service Aspire's 281-million-tonne Ovoot coking coal project, but is also likely to connect with the company's secondary Nuurstei property, where the latest exploration work has returned a 5.6-metre intersection of coal from 34.7 metres and 6.94 metres of coal from 61.2 metres. A maiden coal resource at Nuurstei is expected to be established by the end of 2015. An exploration target for the project has contemplated a resource of up to 25 million tonnes of coal down to 160 metres depth. Aspire's investment in the construction of the Erdenet to Ovoot railway is secured by the fact that the project is of significant importance to national interests, not only in Mongolia but in Russia and China as well. The railway will play an important part in the establishment of an "economic corridor" through Mongolia, the subject of a trilateral agreement signed by the presidents of China, Russia and Mongolia. This economic corridor plan is intended to closely link with Chinese policies to establish a "New Silk Road" to improve Euro-Asian trade, as well as Russia's policy of establishing a Euro-Asian economic zone. Encouragingly, the Mongolian government adopted a rail gauge earlier this year which is compatible with Chinese gauges, symbolising a more cooperative relationship regarding rail infrastructure between the two countries. The provision of a rail construction licence to Aspire represents the important continued support of the Mongolian government to progress the development of the Erdenet to Ovoot corridor. The feasibility of the project is further underpinned by its status as a government plan across three nations. This puts Aspire in an enviable position to realise an ambitious infrastructure project capable of allowing for the exploitation of a massive resource which would otherwise be considered stranded by most junior developers. Over the last three months since the concession was signed, substantial progress has been made in satisfying agreement conditions while Aspire hosted senior executives from a large Chinese banking institution during a visit to Mongolia. Also, Northern Railways has been actively pursuing funding options to complete the other conditions precedent for the rail concession, including environmental permitting and the completion of a Bankable Feasibility Study. The systematic achievement of these milestones could provide share price catalysts for Aspire. Market recognition of Ovoot's long-term potential is coinciding with global coking coal mine closures which are tipped to cause coal prices to improve from 2016 onwards. • Well funded with and delivering on discovery success. • Full funded for winter exploration program. 30 Nov 2015 (BDSec) Berkh Uul (BEU) has dropped to MNT 2,210 losing -15.00% to reach lowest point since 27 June 2012 at MNT 2,201. On the other side, Olloo (OLL) rose to MNT 105 gaining +6.06% rebounding back to the value as of 3 August. Merex (MRX) stock has earned +2.67% to close at MNT 77 on 1,000 shares traded today to reach 2-week low. 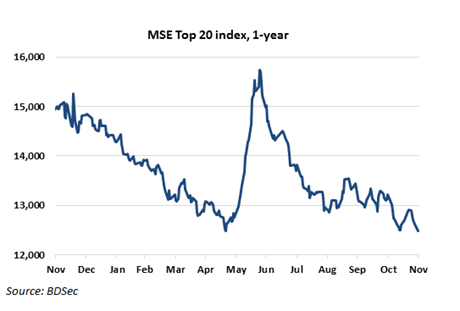 MSE Top-20 index has lost -0.73% to 12,489.58 points today. 24 companies' 4,911 shares with total value of MNT 8,730,778 were traded on the MSE. Gutal (GTL:MSE) has reported +25.9 % assets from MNT 6,18 billion to MNT 7.8 billion and -1.15 % net profit for the quarter ended 30 September compared with the year end result for 2014. Company was first established in 1937 to meet the demand for leather shoes as state owned enterprise and it was privatized in March 1992.The main source of income for the company is renting of its office building and production of shoetrees upon orders (JIT). Gutal shares are now trading at MNT 17,500 and it has reached its record high at MNT 18,400 on 17 August 2015. 1 Dec 2015 (BDSec) Makh Impex (MMX) rose to MNT 3,200 gaining +3.23 % at its 1 month high. On the other side, Aduunchuluun (ADL) has dropped to MNT 1,303 loosing -6.26% to reach lowest point in 6 months on 295 shares traded today. Bayangol Hotel (BNG) has fell by -2.44% to close at MNT 40,000 today to reach 2-week low. MSE Top-20 index has lost another -0.29% to 12,453.87 points to reach 5 year low, lowest point since 23 September 2010. 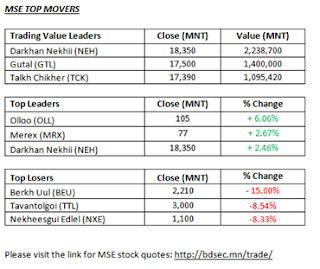 11 companies' 1,837 shares with total value of MNT 3,234,895 were traded on the MSE. 2750 pieces of ZGEB-BL-16/02/16-A0078-0 Government retail bonds and 9,680 pieces of ZGEB-BL-26/01/16-A0071-0 Government retail bond totaling MNT 1,215,552,800 has been traded on the secondary market today. In addition, Ministry of Finance supplied 100,000 pieces or MNT 10.0 billion out of total order 259,541 pieces or MNT25.9 billion worth 28 weeks Government retail bonds with 13.80% yield, making total trade for the day to MNT 11,218,787,695. December 1 (MSE) On 1 December 2015, the bond orders of 28 weeks Government bonds with 13.80% annual interest, placed on order book, and Ministry of Finance supplied 100,000 or MNT10.0 billion out of total order 259,541 pieces or MNT25.9 billion. November 30 (MSE) Mongolian Stock Exchange organized 5 securities trading sessions and made transaction of MNT10.088 billion with daily average transaction of MNT2,017,688,085.80 in period between 23 November 2015 and 27 November 2015. 104,676.00 shares of 29 joint stock companies worth of MNT78,164,949.00 were traded. 52 government retail bonds traded on secondary market of Government securities trading and total of 10,275,480.00 transaction has been made. As of 27 November 2015, market capitalization was MNT1,279,313,198,949.00 which indicated decrease of 1.72% and MSE ALL index reached 899.98 units which indicated decrease of 2.29% from the previous week. · We are initiating coverage on Talkh Chikher (TCK:MO) with a BUY recommendation and a two-year target price of MNT 30,529. This offers a 102% upside from its closing price of MNT 15,100 on November 9, 2015. In fact, TCK is now trading at its lowest level in 17 months, so this could be a very good time to buy beaten-down stock like TCK. · Talkh Chikher has a 60% market share in bread and 20% share in pastry products in Ulaanbaatar and is one of the leading manufacturing companies of the nation. Talkh Chikher is considered a "Blue Chip" Mongolian company and has been included in the MSE's Top 20 index since it was formed in the 1990's. · The company aimed to develop its manufacturing process step by step, under the slogan "European technology into Mongolia" since 2004 and made renovations in the factories ever since. Their primary goals are to increase production capacity, grow with highest quality and new products, lower costs and maximize efficiencies from invested capital. · Talkh Chikher has invested USD 4 million in 2014 for the newly established complete lines of the "Baguette" factory, fully automated boiled products production line, flour transmitting and sifting system, packaging machine and automobile repair shop. · Restrictions to drive on city roads by license plate number was a constraining factor for Talkh Chikher and their ability to utilize full capacity for distribution of their products. However, this issue was resolved by the City Council from 29 May after 3 years and now their vehicles can make deliveries without restriction until noon everyday. · Food production is mainly directed to the local market and there are fewer external factors associated within this market compared with the mining industry etc. The market has therefore continued to grow with consumer purchasing power and demand for new and better products. · TCK performed strongly in 2013, growing revenue and earnings 21% and 61%, respectively and managed to increase them again in 2014 by 34% and 5% respectively. We believe that the consistently strong performance is the result of the investment made in new and modern equipment and an effective marketing policy. Despite these strong top and bottom-line growth rates, TCK trades at only 7.0x `14 EPS. · Our two-year target price of MNT 30,529 is derived using a blended Discounted Cash Flow (DCF) method and P/E multiple on our 2016 earnings estimate. Furthermore, we have run a peers' analysis for cross checking purpose. TCK trades at a large discount to its peers, despite being the leading company in terms of market share, manufacturing technology and quality. · Major risks that TCK could face are flour supply and rising competition. The Mongolian agriculture sector is developing, but the country is still dependent on imported flour. An increase in flour prices will naturally cause margins to fall. The company has limited pricing power, as dozens of small and medium sized bakeries compete for market share in UB. November 23 (BDSec) Chinese commodity demand continues to weaken and is the main challenge for the Mongolian economy. Mongolia's external income is heavily dependent on minerals such as copper, coking coal and iron ore, whose prices have declined significantly. These challenges have started to make their effects felt in most parts of the economy, from businesses to consumer confidence and of course government revenues. However, some MSE-listed companies, especially those whose products are consumer oriented or substitutes for imported goods, are taking advantage of declining raw material prices and shrink­ing imports mainly caused by the current economic situation. Even state-owned coal companies are feeling the positive impact as the government has started price deregulation policy with a purpose of supporting domestic businesses. December 1 (BoM) On the Foreign Exchange Auction held on December 1st, 2015 the BOM has received bid offers of USD 30.3 million in a rate between MNT 1992.50-1996.10, bid offers of CNY 23.8 million in a rate between MNT 310.50-311.50 from local commercial banks respectively. The BOM sold USD 8.0 million in a rate of MNT 1995.61. On 1st, 2015, The BOM has received MNT Swap agreement buying bid offer equivalent to USD 16.45 million from local commercial banks and the BOM has accepted the offers. December 1 (The Economic Club of Ulaanbaatar) On Thursday 3 December 2015, The Economic Club of Ulaanbaatar will present its final event and research results for the year, with speaker M.Khaliunbat, Executive Director of the Silk Road Foundation (SRF), presenting "Mongolia's Changing Demographic 1990-2030" from 7.30 - 9.30am at the Corporate Hotel and Convention Centre. Strategic research into Mongolia's demographic situation is highly necessary in order for decision makers to create accurate and plausible policies surrounding the development of the state's political, social and economic structure, and for the long term planning of private businesses. The research presented will indicate the changing population, specifically how local migration, birth, and death rates will affect the future of the labour market, the social insurance system, and the economy over the next 15 years, based on trends from the past 25 years. Mr. Khaliunbat will discuss the current economic, political and social policies, on what is known and still debated, based on research conducted by the National University of Mongolia, and the SRF Think Tank in 2015. He will also reflect on how Mongolian demography has shifted since 1990. How will structure reform of Mongolia's population by 2030 affect the labour market, infrastructure, social insurance and the state's development? What mistakes have we made about demography? How many Mongolian's will live and work abroad by 2030 and how will this affect the economy? What pressures will Ulaanbaatar face with continued migration from the countryside? These are just some of the questions that will be answered, and open for discussion amongst attendees. The Economic Club of Ulaanbaatar is just one of the projects established by the Silk Road Foundation (SRF) and provides an opportunity for top business professionals, economists, politicians and decision makers to discuss the major economic issues facing Mongolia. The session will be moderated by independent economist and ECUB President Mr D.Jargalsaikhan, and situated in the Berlin Room at the Corporate Hotel and Convention Centre. For guests interested in attending this presentation, please register with the SRF by 6.00pm, Tuesday 1 December via email econclub.ub@gmail.com. Tickets are 45'000 MNT for guests and 25'000 MNT for members, including a hot buffet breakfast. December 1 (gogo.mn) Standing Committee meeting is scheduled for today. ​2. Millennium Development Goal and decreasing poverty Sub Committee meeting at 09AM. 3. Social Policy, Education and Culture Standing Committee meeting. 4. Environment, Food and Agriculture Standing Committee meeting at 02PM. 4. Application Standing Committee meeting at 02PM. 5. Economic and Budget Standing Committees joint meeting at 03PM. December 1 (news.mn) The Parliament has approved the "The Taxation Law on the Individual Person's Income", which has one important provision. In detail; under this law, a foreign citizen will pay taxes from their savings, and Mongolians will pay taxes, if they exceed MNT 100 million in bank savings (in excess of one year). This provision is included in order to obtain taxes from the people who have large savings which are held in banks with the long-term savings accounts. Now approved, "The Taxation Law on the Individual Person's Income" will come into force from 1st January 2016. The Government agreed to postpone this draft law by 2 years. December 1 (gogo.mn) Authorities from Erdenes Tavan Tolgoi and "Unity" Labor Union established the cooperation agreement on December 1. Representatives from both sides quickly finalized the dispute and reached the agreement. Moreover, preparation works to commence mining operations in eastern Tsankh mine on December 12 are underway. Current employees of the company will stay and keep their workplaces as the result of the agreement. December 1 (gogo.mn) Minister of Industry D.Erdenebat reported that copper-processing plant based on Tsagaan Suvarga and Oyu Tolgoi is going to be established in Bor-Undur region. He informed about the plant, as several MPs were delivering the response of the inquiry addressed to PM about intensifying works to establish copper processing plant. Oil refinery with the capacity of processing 300 thousand tons of oil per year will be also established in Eastern region. With the establishment of copper purifying and smelting plant, it will generate 23% profit margin. Also, the feasibility study suggests that the project is going to reach the breakeven within first 9 years. The discussion to establish a copper smelter has been underway for over 30 years, and various researches and feasibility studies have been done. The government is making efforts lately in order to intensify works to establish the smelter within the implementation of state policies and guidelines on the industry. The copper smelter project is considered to take the short period of time. International investors are eager to get involved in the project, as local investors are interested in financing establishment of sub-plants. Also, a copper cathode to be generated from the smelter can be used as base materials for producing electronic products. The smelter is estimated to reuse 8000 cube meter of water a day, which is used by spar processing plant. In addition, Minister of Mining R.Jigjid delivered information regarding the implementation of the law on oil. Oil refinery set to be established according to the parliament resolution. Namely, oil refinery with the capacity of processing 300 thousand tons of crude oil per year will be constructed. As of today, research works are underway, as the project is expected to commence in upcoming spring of next year. Pre-feasibility study of oil refinery to be constructed in Gobi region also has been finalized. Despite 15 projects of oil refinery initiated and developed, none of them have been finally materialized. December 1 (news.mn) The two-storey printing house of the "Ulaanbaatar Times" newspaper, which is located in the east side of Government House was sold during an open-auction which was held on 30th November. The building is situated on 2698 sq. meters of land and has a total area of 5244 sq. meters. It is built on reinforced concrete foundations and has brick walls. The auction price started from MNT 7,155 billion; the final selling price was MNT 24 billion. The buyer was Abdul Karim, who has Mongolian citizenship. The bidders, in detail, consisted of nine people and entities: Capitron Bank, Tavan Bogd Trade, Bluemon Company, and the individuals - V.Enhbaatar, B.Batnyagt, Z.Purev-Ochir, B.Otgonjargal, R.Mandah, and Abdul Karim. The City Administration had declared this building to be inadequate. The City Administration has planned to accumulate MNT 43 billion though auctions; currently, MNT 34 billion has been raised. The next open auctions will be held on 14th December. December 1 (news.mn) The Mongolian Business Database (MDB) has organized the first "MDB Business Networking" event for foreign and domestic companies wishing to buy Mongolian products. The purpose of the event is to promote co-operation between foreign and domestic entrepreneurs, to exchange experience and to share useful information for business development. The Director at the Economic Development Office at the UB City Administration, E.Temuulin, the Australian consul and the local representative of "AUSTRADE", Mr. Brendan Coin, the director of the "Your Business Bridge" and "MDB" director, I.Ser-Od, and the director of "InTOR Finance" G.Uuriintuya participated in the "MDB Business Networking" event. The topics, discussed included: "Doing Business with Australia", "Concession Projects for Ulaanbaatar", business opportunities and business taxation. In the future, the event will be held on a regular basis. The head of the trade and economy office at the Czech Embassy, Ladislav Horak, and the chairman of the Mongolian and British Chamber of Commerce, Mr. John Grogan will participate. We would like to share with you some exciting news about Horizon Partners! Our company is honored to be recognized by a London-based "Global Banking and Finance Review Institution" as a "Best New Investment Advisory Firm Mongolia 2015" and "Best New Real Estate Fund-Raising Company Mongolia 2015" by winning this year's awards in both categories. "Global Banking and Finance Review Award" is a highly esteemed global recognition by an internationally reputable and influential institution of which recipients comprise of senior decision makers from fortune 500 companies, large banks, financial institutions and Central Banks from 190 different countries. The Global Banking and Finance Review awards are known to have a comprehensive due diligence process in nominating and selecting companies. The review provides a reliable, high quality and in-depth insights of organizational operations in a clear, informative and concise way throughout the global banking and financial community reflecting the innovation, achievement, strategy, progressive and inspirational changes taking place within the financial sector of each nations. We would like to congratulate all of our team members, partner companies and valued clients, as this award is intelligibly a recognition of your efforts, commitments and success too. We highly look forward to a more fruitful business cooperation and friendship in the coming years. Horizon Partners LLC (Horizon) is a local investment advisory, fund-raising and project development firm based in Ulaanbaatar – the capital of one of the World's fastest growing economies. The firm promotes the growth of businesses in various fields ranging from real estate and manufacturing to trade and services. Horizon's clients include large public and private companies as well as SMEs and start-ups. The firm has a broad spectrum of services which add clear value to its clients businesses, mainly facilitating them with the professional management and financial expertise and access to the necessary capital through its well established global and local networks. To the other side, Horizon offers a lucrative platform for international investors and companies to invest, expand and enter the frontier market of Mongolia. It will promote their use of electric heating during nighttime. The cabinet approved this initiative of the Minister of Energy D.Zorigt on Monday. Nighttime regime is pursued from 21.00 to 06.00. This is expected to contribute greatly to the actions for reducing Ulaanbaatar's air pollution. Officials say 40 percent of the distributed electric power is used by apartment residents, while the 60 percent is consumed by the ger area residents. As the power tariff discount launches, the ger area households are required to replace their simple electricity meters with kilowatt/hour meters. According to the Energy Regulatory Commission, the current nighttime electricity tariff stands at 77.10 MNT for kWT/h. It has been halved to be 38.55 MNT for the ger areas. We deliver you the Statement by His Excellency Tsakhiagiin Elbegdorj, President of Mongolia at the Leaders Event of the 21st Session of the Conference of Parties to the United Nations Framework Convention on Climate Change. I congratulate and commend the Government of France on its dedication and leading role in hosting this historic 21st Session of the Climate Change Conference. Today the humanity is facing two most urgent global challenges. First is the rise of terrorism. The latest victim is France itself. Once again I re-affirm our solidarity with the people of France. Second is the global climate disturbance. The victim is the mother-earth and the entire human race. Let us put our differences aside. Then we will succeed. Just as we succeeded to adopt the 2030 Agenda for Sustainable Development in New York. I am confident, we can re-affirm our commitment and responsibilities for the wellbeing of the people of earth. Let us all review and renew our commitments. Let us chart our roles and responsibilities. Let us mobilize all the real potentials and resources each and every one of us can offer. First; FINANCE. Any serious endeavor cannot be fully accomplished without adequate financial and technical support. Mongolia has vast opportunities in renewable energy. Yet, renewable energy remains costly. It is at least a quarter more expensive than the energy produced from fossil fuel. Therefore, let us synergize our resources and potentials through joint investment and development. Second; ACCOUNTABILITY. I urge now for no more retreats, no more disappointments. I hope this time we will have an agreement. It must entail heightened accountability for the commitments we make. The communities we represent can no longer afford one more global document if there is no clear exercise of accountability. Therefore, I emphasize accountability, accountability and more accountability. Third; EMISSIONS PER CAPITA. I propose instituting a new measurement on emissions – Emission Per Capita. It will help us track our emission footprints and adjust policies and actions. It will tighten our accountability and provide a fair taxation base on emissions. For the first time in human history, more than 150 heads of state and government gathered today in one spot. For the first time we have come together to agree on the epic-scale contract to save the mother-earth. It is our shared duty to hand over our one blue planet, safe and sound, to our next generation. Thank you, beautiful Paris, for hosting us. I hope you will save our mother-earth and the entire humanity from the facing dangers. Alicia Campi, President of the US-Mongolia Advisory Group, explains that "ex-communist Mongolia successfully reinvented itself as a free market, globally connected democratic nation that still has much to offer to its region." November 17 (Asia Pacific Bulletin, East-West Center) Mongolia is spending 2015 celebrating 25 years of democracy while reassessing its progress in nation building and economic development. Mongolia's government, as it enters into a two‐year‐long election cycle, has made restoring FDI and reviving the economy its top priorities while being responsive to popular concerns about mineral‐based development. This political reality may negatively impact discussions with foreign investors on operating its state‐owned mining deposits, Oyu Tolgoi (OT) (copper) and Tavan Tolgoi (TT) (coal/uranium). However, it is worth recalling that ex‐communist Mongolia successfully reinvented itself as a free market, globally connected democratic nation that still has much to offer to its region. The vibrancy of Mongolia's democracy is evidenced in its 12 national elections (presidential and parliamentary) and 16 local parliamentary elections since 1990. The overarching concept guiding the country's political and national security has been its 'third neighbor' policy of balancing its relations with its two border neighbors, Russia and China, and reaching out to other democracies including the U.S., Japan, the European Community, and South Korea, for political and economic support. Mongolia upgraded its military expertise via U.N. peacekeeping operations in Iraq, Sudan, Congo, and Western Sahara, and 13 years of joint multinational military exercises called Khaan Quest hosted annually by Mongolia and co‐sponsored by U.S. Army, Pacific and U.S. Marine Corps Forces, Pacific. Concurrently, Mongolia has annual military exercises with Russia and conducted eight rounds of anti‐ terrorism and border defense consultations with China. The country's traditional herding and agricultural economy has greatly benefited from development of its mining‐sector (per capita GDP in 2014 was estimated at $11,900) and its copper, gold, and coal deposits have been major magnets for FDI . Mongolia during the communist era was dependent on Soviet assistance for one‐third of its GDP. In the early 1990s generous foreign assistance from Western nations, particularly Japan, Germany and the U.S., rescued the nation from deep recession. After Mongolia simultaneously implemented market reforms through extensive privatization and joined the World Trade Organization, it established the foundation for economic growth but ushered in major corruption. GDP growth averaged nearly 9% per year in 2004‐08, as it reoriented its economy towards FDI in large‐scale mining and benefited from high commodity prices. During the 2008 global financial crisis, Mongolia, simulated by IMF and other loans, strengthened its banking sector and fiscal management. China became Mongolia's major trade partner and investor during the past 15 years, which caused domestic unease and calls for trade diversification. Out of concern that 90% of Mongolia's gasoline and diesel fuel was purchased from Russia, the Mongols since 2014 have diversified foreign suppliers and moved to construct domestic refineries. The country's major economic stimulus has been a 2009 parliamentary investment agreement with a Rio Tinto‐led international consortium to develop OT, a giant copper‐gold deposit. Mongolia's GDP growth soared to a high of 17.5% in 2011 before beginning its descent. In 2014 growth was 7.8% with OT revenues alone contributing 4.8 percentage points. However, the agreement's terms and FDI in general have become controversial domestically, causing investment legislation reversals and protracted disputes with foreign investors that have damaged FDI attractiveness. 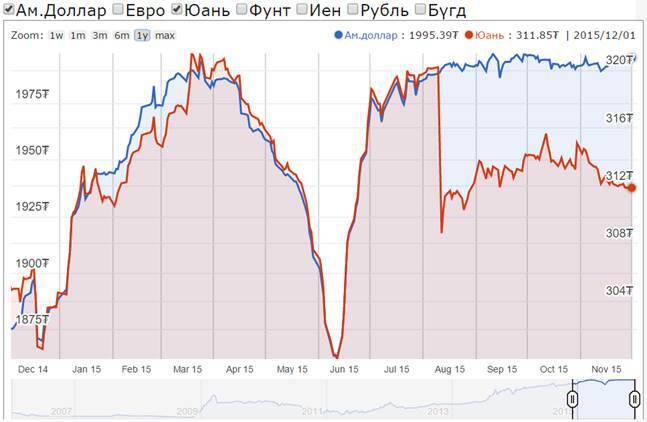 Today Mongolia, with almost a 30% poverty rate, faces loss of investor confidence and a precipitous FDI drop. Slowing Chinese demand for Mongolian minerals and depressed mineral prices together with loose fiscal and monetary policies have weakened the economy, caused high inflation, and deteriorated the currency. Meanwhile, steep repayments for $5.35 billion in outstanding loans loom. Such are the challenges prior to 2016 parliamentary and 2017 presidential elections. 1) Redefinition of 'third neighbor': This on-going policy was successful politically in allowing the nation to expand ties with democratic nations to both counterbalance Russian and Chinese influence and increase Mongolia's international profile. However, it failed to prevent a 90% Chinese monopoly over its economy nor to generate sufficient western FDI. Thus Mongolia is expanding and redefining its "third neighbor" definition to emphasize India, Turkey, Persian Gulf nations, Vietnam, and even Iran to diversify its mineral trade partners and find new sources of energy and consumer goods. 2) Trilateralism: In response to Chinese and Russian rapprochement, since 2014, Mongolia has been promoting a "neighbor trilateralism" policy at the presidential summit level. However, to avoid any misunderstanding about Mongolia's commitment to democracy, the Mongols in September 2015 initiated a "democratic trilateralism" encompassing Japan and the U.S.
3) Permanent neutrality: In a surprise move, Mongolia announced at the UN in September 2015 that it would seek United Nations ratification of its "permanent neutrality." While this may free Mongolia from joining the Shanghai Cooperation Organization and Russian Customs Union, it could have ramifications for Mongolia's continued status in NATO's Individual Partnership and Cooperation Programme and US‐supported Khaan Quest annual military exercises. 4) Promoting new international organizations: One feature of Mongolia's third neighbor expansion has been to establish an International Cooperation Fund to share its experiences in democracy building, human rights, and market economy with other ex‐socialist/ communist nations such as Myanmar, Kyrgyzstan, and Afghanistan through training programs for government officials and diplomats. Mongolia also is more active in tackling broader Asian issues that impact its regional transportation grid. Prime examples are the Ulaanbaatar Dialogue on Northeast Asian Security to discuss North‐South Korean issues, the Mongolian‐Russian‐Chinese Northern Railway, and the just announced dialogue platform, Forum of Asia. 5) Greater international activism: The most recent example is the election of Mongolia to the UN Human Rights Council for 2016‐2018 on October 28th with the highest vote count among the Asian candidates. In 2016 it will host the World Economic Forum's East Asia Summit and the 11th annual Asia Europe Meeting (ASEM). 6) Brand Mongolia: Mongolia in 2013 initiated a "branding" export campaign aimed primarily at organic agricultural and nomadic products. The goal is to increase and diversify trade, FDI, and tourism. U.S. policymakers, regardless of party, have supported Mongolia 's free market and democratic development over the past 25 years. Both countries re cognize that their strong political‐military neighborly relationship must ultimately be rein forced by greater economic ties. This is the challenge in front of the new U.S. Ambassador, Ms. Jennifer Galt, appointed in September. Despite the obstacles, U.S.‐Mongolian relations continue to prosper because Mongolia is committed to democracy. President Elbegdorj at the 25th anniversary celebrations mentioned three points crucial for Mongolia's future : 1) Development of Mongolia's democracy depends only on the Mongols, 2) Mongolia should focus now on combating terrorism but learn from its own communist experience, 3) Democracy "is a really difficult and torturous process....Therefore, we should make efforts every day for democracy and take care of it." There I was, an Indian woman on the move in Mongolia - and it didn't feel strange. So much resonated - especially the voices of other women - like Monjago, a herder, Munkhtsetseg, a horse trainer, Onika, a student, Amgalan, a language teacher and Jainaa, a singer. They made faraway feel like home. Produced for Outer Voices (outervoices.org) which weaves unheard stories from remote parts of the world into contemporary media to educate, support and inspire others to action. Additional Translations: Munkhzul Dorjsuren, Oyu Choijamts, Delgerjargal Uvsh. December 1 (President.mn) President of Mongolia Tsakhiagiin Elbegdorj is attending the United Nations Climate Change Conference (COP21), in Paris these days. On the sidelines of the Conference, President Elbegdorj has received a certificate approving that the Burkhan Khaldun Mountain of Mongolia and its surrounding landscape has been registered to the UNESCO's World Heritage List. Ms. Irina Bokova, the Director-General of the UNESCO has handed over the certificate. On September 20, 2010, President of Mongolia issued a Decree on protecting the Burkhan Khaldun Mountain and its surrounding landscape and including the mountain in the UNESCO's World Heritage List. Today, the President of Mongolia has received the certificate – the embodiment of his Decree issued 5 years ago. After, President Elbegdorj held a meeting with Director-General of the UNESCO Irina Bokova and exchanged views on the bilateral cooperation. The President congratulated the UNESCO on its 70th anniversary and expressed his satisfaction over the mutual relations and cooperation between Mongolia and the UNESCO. President of Mongolia highly valued the UNESCO's contribution to spreading science education, eliminating illiteracy, protecting the national, cultural and historic heritages, introducing new technologies, strengthening human rights and the economic development of Mongolia. Ulaanbaatar, December 1 (MONTSAME) A.Bayartsetseg, the contestant from Mongolia to the Miss Earth-2015, has won her third medal in the international beauty contest, having grabbed the Cooking Creative Challenge with her team. She has gained a bronze medal in the Cocktail Wear competition attending it in a purple dress created by Mongolian designer Otgonjargal. The Miss Mongolia has grabbed a gold medal winning the Evening Gown competition. Miss Earth 2015 pageant will run this December 5 at Marx Halle in Vienna of Austria. December 1 (gogo.mn) On November 30, annual "Goyol-2016" Fashion Festival organized by the Mongolian Designer Association was awarded its Fashion industry bests and Top Model award went to H.Uyanga and is to hold the Top Model title from now on.